Due to the wild, fluctuating weather patterns that have hit over the past week, there are a number of published articles by UMN Extension Specialists that address information on effects of frost or cold temperatures, what soil moisture levels interaction with pre-emerge herbicides, and pest management questions that are starting to pop up around the region. There are multiple ways to receive news updates through extension. Currently, the Minnesota Crop News is becoming one of the quickest venues to receive updates on cropping issues at the statewide level. Links to current articles are listed in the right column. We would also encourage you to subscribe by e-mail to receive these notices as they are published. 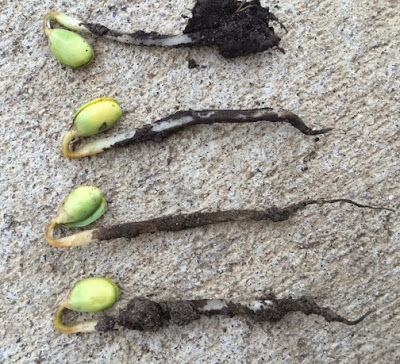 "I am starting to receive calls and photos of soybeans injured by frost in areas of southwest and central Minnesota. "Reports so far are of freeze injury to the crook of soybean plants in the process of emerging. Relationships of injury to residue, topography and, of course, planting date and it sounds that larger soybeans were fine. "Plants injured this way can be killed or severely calloused but this depends on the extent of the freeze. "Time is needed to evaluate the extent of injury and determine if a replant strategy is needed. "